I am very worried about my German Shepherd King. I have tile in my home and he very frequently slides when he is excited. 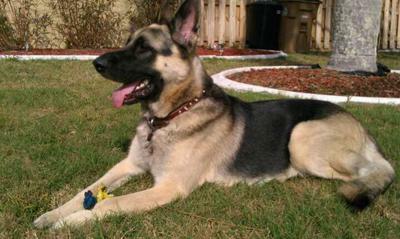 He is a pretty big shepherd weighing around 115 pounds and he is just a year old. I know that the solution would be to get carpet but it is not that easy, and very expensive. I just really don't want him to increase his chances of hip displaysia. Pleasssse let me know if there is any other solution than putting tile in my home! Then we had to do training with the carpets so that he would leave them alone which took some time but he finally got it. Now we've removed the carpet runners since he's slowed down a good bit overall - though he still does it from time to time. So you might have to consider a short term fix like this to your problem. It's not permanent but it does help until your GSD comes to learn to slow it down so it doesn't slide all over the house. Good luck! Comments for IS THERE ANYTHING I CAN DO FOR MY SHEPHERDS SLIDING IF I HAVE TILE IN THE HOUSE? We have wooden floors and our GSD does skid a little when the Postman comes! We use my husband's hair clippers to trim her paw fur. She doesn't mind at all and it does seem to help!